On the prior post we discussed that faith literally strengthens the spirit like exercise strengthens the body. We also came to the conclusion that faith is taking a step into the unknown in a search for truth. So we can easily say that without this search for truth we will stay in the state we are in and no growth will be seen. Your life will become stagnant and this state can lead to depression or self-resentment. This is simply the spirit becoming weak from the lack of exercise. So where can we find truth, and where do we begin our search? Truth… there are some definate truths in this life, although the world is definately blurring every line possible… let’s talk some definate truths. Truth: What you put inside, shows on the outside. Let’s put this in terms of food. “You are what you eat, right?” One day you decide that you want to start eating more healthy, to do so you have to interupt your old habits with new ones. At first, you feel the bad food is much easier… to get, make, eat, it’s convenient, because it’s what your used to. At first it seems bad food taste good and the good food taste bad, but after a little bit of detox from the bad, and when you go back to it, you wonder how in the world did I like this! It was what you were used to, it is the story told to your brain to believe as truth, even though your body repeatedly told you it was a lie by your reaction to it. The real and definite truth will always remain. Results will always show the truth. The results of the two different food choices will absolutely show the results they bring. Food is meant to fuel your body, is this good fuel, or bad, your body will run accordingly. Truth-If you eat bad foods you will have poor results. Truth-If you eat good foods you will have good results. This is just a simple truth that everyone more or less knows, most fight it and pay the consequences, and unfortunately can have a serious impact in your life, good or bad. Once you start putting good things in your body, it will crave more. Fill it with truths. The more truth you know, the more free you will become. There are many forms of truths or lies you can put into your life, that will provide lasting results. All of this has holds true and is a direct parallel to the Spirit. Just as, learning to have discipline and incorporating simple truths in your diet will enhance your life, you can do the same in your spirit. A disciplined spirit will add truth everyday, when we use faith to apply it, we can expect a positive result to manifest. Feeding your spirit, will cause rapid growth on the inside, which will absolutely show on the outside. Growth in wisdom and fullness of life will be more than apparent than ever before. Disciplines and practices that grow and feed the spirit are reading, memorizing and meditating on scripture, praying heart felt prayers of thanksgiving, compassion for others, asking for growth, reading books that feed your soul, or books that increase your understanding and wisdom. Things that keep the spirit and the mind focused on positive and pure and healthy things and behaviors. Then allowing the mind and body to be creative with the learned wisdom and knowledge and putting it into practice where ever possible in your life, will make the spirit grow and thrive. How can this happen you ask? Truth always builds in a positive manner and never destroys. When we allow toxic things in our lives, they bock and hinder the spirit. Toxic or negative things such as: gossip, bad thoughts, bad things on television, bad music, comparison, envy, or anything that hurts God or any other individual. The world teaches us that negative things are more fun, but we know better by how we feel inside, during or after we partake in the toxic behaviors. Just like a Krispy Kream donut may seem good for a moment, but very quickly your body tells you it wasn’t and your almost always instantly filled with regret. Just as your body tells you that maybe wasnt a great idea, and definately wasnt worth it. So does your spirit when you feed it poorly. Sin, like donuts will always give you guilt gut! This is why scripture tells us plainly to meditate on things that are positive and pure (Philipians 4:8). The truth is always pure and good and feeds the spirit and makes it stronger. Start to feed it correctly, you will feel the difference. Continue in faith and search for the truth and feed it more daily, just as the body needs refueled, so does the spirit. Truth builds upon truth and continues to reveal more truth. 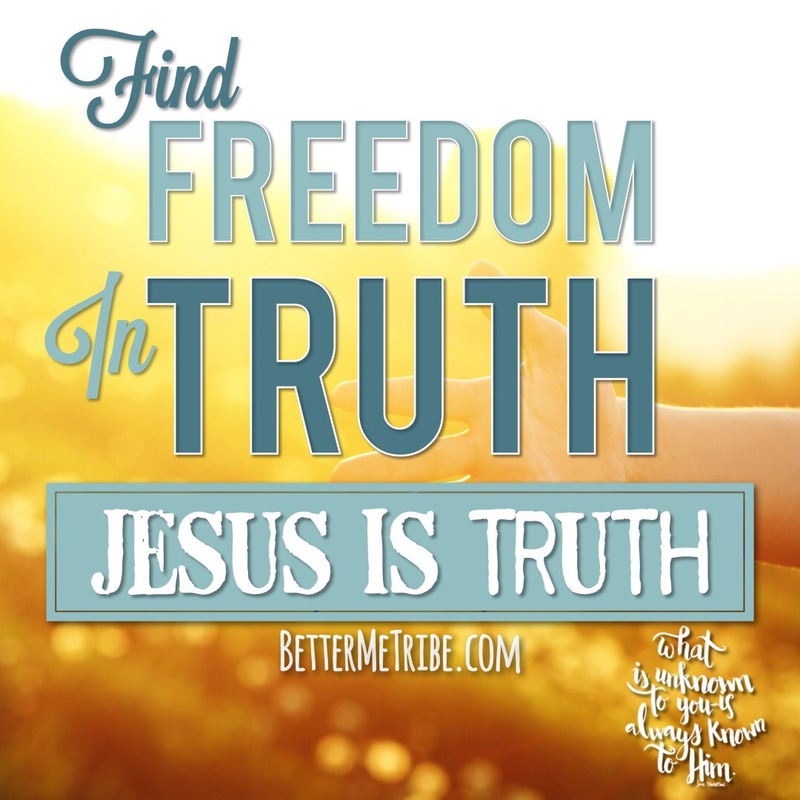 “Then you will know the truth, and the truth shall set you free.”-John 8:32.